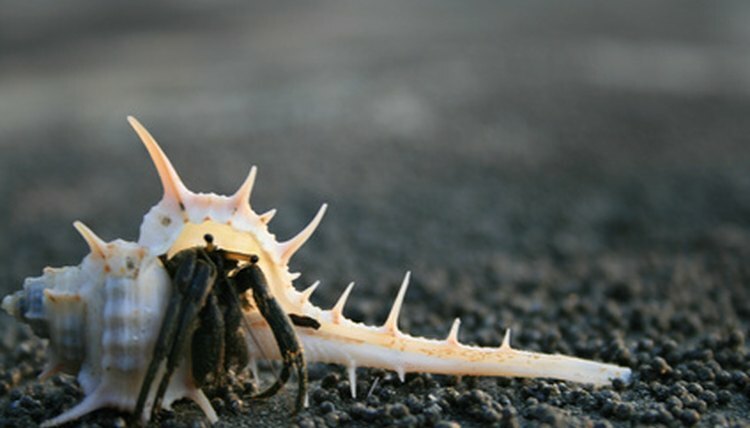 Hermit crabs have modified gills that allow them to live on land. Because they're gills and not lungs, the hermit crab breathing apparatus requires a cocoon of moisture to function. High habitat humidity, therefore, is crucial. Monitoring humidity levels and increasing moisture as required is the most important part of hermit crab care, more even than diet. Soak a natural sponge, available from aquarium and household supply stores, in fresh dechlorinated water and place in the tank. This not only helps to raise the humidity but provides a refuge for the crabs if they feel too dry. Replace the sponge with a new one every day to prevent buildup of bacteria and fungi. Sterilize the old one for reuse by boiling in dechlorinated water for at least 15 minutes. Insert a hygrometer -- humidity gauge -- in the tank. Take a reading of the relative humidity every day. It should not drop below 70 percent. If it does, add moisture as a matter of urgency. Mist the tank lightly with dechlorinated water to raise the humidity. Position more shallow bowls of water and another sponge in the tank to maintain moisture levels. Moisten moss and add it to the tank. This enhances the habitat as well as helping to increase humidity. Place an airstone, available from aquarium suppliers, in a bowl of water to the tank and switch it on. The bubbling means more water evaporates, making it an effective way to maintain high humidity. Take a humidity reading for the room in which you keep the hermit crab tank. Replace a mesh lid with a plastic or glass one if the room is dry or cold. Alternatively, cover some of the lid with plastic wrap. Raise the humidity of the room itself, if desired, by leaving out bowls of water and adding some houseplants.  The tank should always contain a shallow bowl of fresh water and another of salt water, regardless of humidity levels. Hermit crabs need the first for drinking and the second to regulate salt levels in their bodies.  Dechlorinate water by using a commercial dechlorinator or simply by leaving buckets of water exposed to air for 24 hours. Note that this removes chlorine but not chloramine. You could also use bottled drinking water.